PT Asuransi Kredit Indonesia (Persero) - ASKRINDO or referred to as "PT ASKRINDO (Persero)" is a well-established state-owned credit insurance company in Indonesia and is fully-owned by the Government of Indonesia. Headquartered in Jakarta, ASKRINDO operates primarily as a provider of credit insurance products in Indonesia. Its services which include Micro Credit Guarante (KUR), credit insurance, surety-ship, credit management services, general insurance and reinsurance. As of December 2016, ASKRINDO runs its business through 61 offices networks spread across Indonesia. Its office networks comprise of 5 class I branch offices, 7 class II branch offices, 20 class III branch offices, 28 class IV branch offices, and 1 marketing Office. ASKRINDO's head office is located at Askrindo Building, Jl Angkasa Blok B-9, Kav 8 Jakarta. ASKRINDO now has 3 subsidiaries: PT Reasuransi Nasional Indonesia, PT Jaminan Pembiayaan Askrindo Syariah, and PT Askrindo Mitra Utama. In terms of financial performance, ASKRINDO posted an increase of 8.59% in total assets from Rp 9.98 trillion in 2015 to Rp 10.83 trillion in 2016. ASKRINDO’s Liabilities in 2016 amounted to Rp3.17 trillion, which was an increase of 42.63% from the previous year of Rp 2.22 trillion. Total current year profit in 2016 was Rp907.86 billion, a decline by 10.41% from Rp1,002.41 billion in 2015. This figures was stated by PT Asuransi Kredit Indonesia (Persero) Annual Report 2016 as cited by JobsCDC.com. Have a wide business relations. JobsCDC.com now available on android device. Download now on Google Play here. Please be aware of recruitment fraud. The entire stage of this selection process is free of charge. 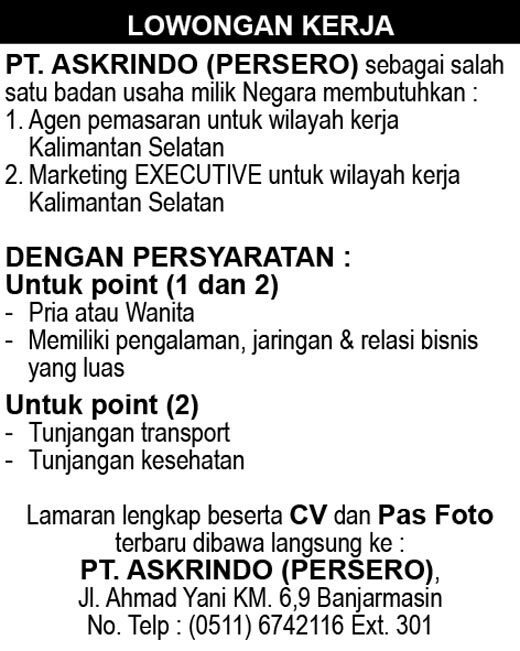 PT ASKRINDO (Persero) - Marketing Agency, Marketing Executive ASKRINDO October 2017 will never ask for fees or upfront payments for any purposes during the recruitment process such as transportation and accommodation.